SAN DIEGO, CA--(eSolarEnergyNews)--EDF Renewable Energy today announced the acquisition of the 179 megawatt AC (MWac) Switch Station 1 and Switch Station 2 Solar Projects from First Solar, Inc. (NASDAQ: FSLR) in late June. The projects, currently under construction, will sell their combined output and environmental attributes under three Power Purchase Agreements to subsidiaries of NV Energy, Inc. (Nevada Power Company d/b/a NV Energy and Sierra Pacific Power Company d/b/a NV Energy); Commercial Operation Dates (COD) for the two projects are scheduled for late July 2017 and late September 2017, respectively. 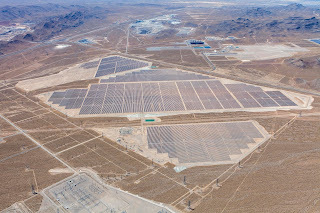 Located in Clark County, Nevada on land managed by the US Bureau of Land Management (BLM) in the Dry Lake Solar Energy Zone (SEZ), the projects are comprised of First Solar modules on horizontal single-axis trackers. The expected electricity generated at full capacity is enough to meet the consumption of approximately 46,000 Nevada homes. This is equivalent to avoiding more than 265,000 metric tons of CO₂ emissions annually1 which represents the greenhouse gas emissions from 52,000 passenger vehicles driven over the course of one year. EDF Renewable Energy is one of the largest renewable energy developers in North America with 9 gigawatts of wind, solar, biomass, and biogas projects developed throughout the U.S., Canada, and Mexico. 1 According to US EPA Greenhouse Gas Equivalencies calculations. EDF Renewable Energy is a leading US independent power producer with 30 years of expertise in the renewable industry, covering all range of services from project origination, development, sales and marketing, to long-term asset management. EDF Renewable Energy specializes in wind and solar photovoltaic with presence in other segments of the renewable energy market: storage, biogas, biomass, hydro, and marine energy. EDF Renewable Energy’s North American portfolio consists of 9 gigawatts of developed projects with 4.4 gigawatts of installed capacity throughout the US, Canada, and Mexico. The operations and maintenance subsidiary, EDF Renewable Services, operates 10 GW throughout North America. EDF Renewable Energy is a subsidiary of EDF Energies Nouvelles. EDF Energies Nouvelles is the renewable energy arm of the EDF group, the leading electricity company in the world. For more information visit: www.edf-re.com. First Solar is a leading global provider of comprehensive photovoltaic (PV) solar systems which use its advanced module and system technology. The company’s integrated power plant solutions deliver an economically attractive alternative to fossil-fuel electricity generation today. From raw material sourcing through end-of-life module recycling, First Solar’s renewable energy systems protect and enhance the environment. For more information about First Solar, please visit www.firstsolar.com.